England to India: "Jude's Desert Dash Home"
I wish I had time to give more thought as to what to write. Nanny passed away peacefully early in the morning of the 20th of January with her daughters by her side. I have left the post below unchanged. For the best view of the photos in this blog I recommend hitting the 'F11' key to go full-screen. On the afternoon of the 8th of December, 2012 I was sat on the western shore of Lake Iskanderkul, Tajikistan, pictured below, hoping that the path beyond Iskanderkul would lead me to another road. It was that or I would have to turn around and track back on my last few days' progress. I had cycled about 9,900km over 6 months from England to get there. Fast-forward two days and I wasn't further into the mountains as hoped, instead I was sleeping in a double bed in my parents' new house in Bath, England. How on Earth could something like this happen? Thankfully, I hadn't decided to give up on my trip. Far from it. It had taken me a few days of hard cycling through snow and the most polluted tunnel I hope to ever venture into to get to those crystal clear waters of Iskanderkul, and I was in the mood for rest and thoughtfulness as I let the low sun dry my sleeping equipment. As a thousand people have written before; being in such a place, so far away from people and our civilisation, our take on the world, high up in the stone cold mountains, untouched and unchanged for years gone by invokes a feeling inside of the witness. It is a feeling of realisation, clarity and of a different understanding. In fact, it didn't matter how far away I was from civilisation; all that mattered was that civilisation wasn't there, in that spot where I was. And it didn't matter what my thoughts on humanity were. This place was not bliss because it was better than human civilisation. This place was bliss because it couldn't be judged, there was no opinion to form on whether I thought it was right or wrong, loving or hateful; this was an area of Earth which simply was. It was rock and water, air and frost, light and dark as it always had been. I suppose, when one spends so much of one's life in a world shaped and formed by humans, the relief comes in being able to witness the way the world was before we had our say. One of the subjects on my mind on that contemplative afternoon was my very poorly grandmother, who was receiving care in St. Margaret's Hospice. When I left England six months earlier I knew there was a chance that I may not see her again. At the same time, however, I had originally expected to reach India and fly back to England by December. So my mind wasn't sure. Now, thanks to the wonders of modern technology, sat by that lake, I was almost certain that if I continued my trip at its current pace, I would have very little chance of seeing Nanny. And it was only then that I decided that I wasn't ok with this; I wanted to see her one more time. Panic, emotion, and amazing logistical organisation ensued. Unfortunately, that morning I had decided to unpack and air almost all of my belongings meaning that getting out of there wasn't going to be straightforward. I was convinced that in my rushed thinking, with my eyes welled up, I was going to forget something. Almost every day for the last few months I had been telling myself that I was at peace with the idea of not seeing Nanny again, as life must take its course and I must continue my journey. Now I had finally given up being strong, I knew that I did in fact have emotion relating to this matter and that only listening to my rational thoughts was no longer the way I would deal with this. It was 24km along a steep dirt-track, ruined by landslides, before I could get to the asphalt road leading back to the capital. I stopped only once, to look back and take a of photo of a place which I would never have imagined would turn out to be so important to me. I knew that once I got back to the main road I had two choices; cycle back up the 1,100m vertical ascent, so steep that I had been overtaking cars when coming down it the day before, to the Anzob tunnel (pictured below from when I passed through it coming the other way) or stick my hand out and try and hitch a lift for the first time ever. Thanfully I quickly found a good spot to try and hitch from; a bus stop with plenty of space for a truck to pull into. The only vehicles I'd seen before on this road were shared 4x4 'taxis' and haulage trucks. In my mind I was hoping to be offered a ride by a truck, as the taxis often have nine or ten people in and are packed full of luggage. The first Jeep came past and I stuck my hand out, palm faced to the ground, and gestured for it to slow down (sticking your thumb up isn't recognised in these parts and in Iran traditionally means the same as a middle finger). Of course I had no chance, even if there was a spare seat; the roof and boot had no space for my large bike. A couple of minutes later a truck passed. I was more hopeful. I added some desperate facial gestures to my hand movements to try and convince the driver. As he passed he lifted both hands in the air as if to say "there's nothing I can do". 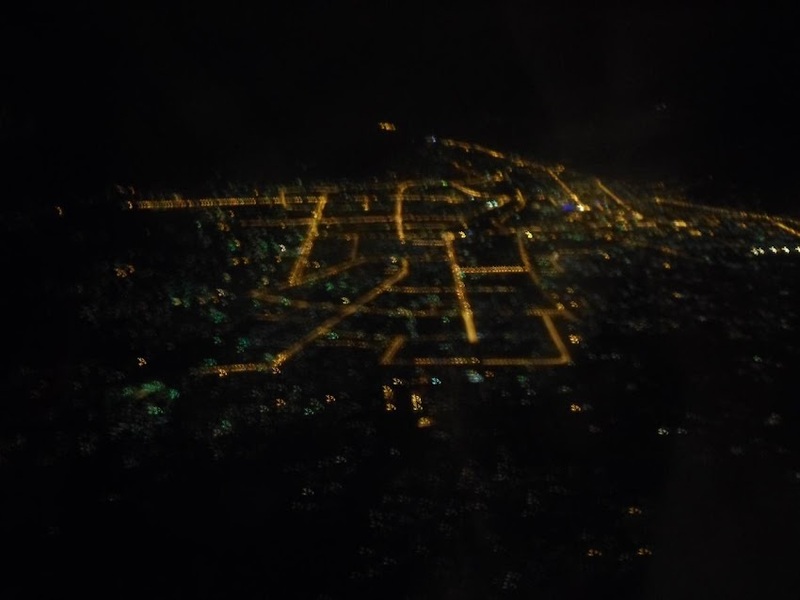 At this point I decided that if I couldn't get a lift before dark I would cycle up the mountain at night, sleep at the top for one or two hours and free-wheel down to Dushanbe in the morning. I really was desperate, I didn't know whether I had 24, 48 or 72 hours to get back. I decided that I needed to be tough in my mind. I called upon my old mindset I used when working as a cold-calling telesales person. Rejection came just about every phone call and it didn't phase me then so I wouldn't let it phase me standing on the side of the road in this foreign country, feeling helplessly stuck, either. The third vehicle I saw was another 4x4, all its windows blacked out. There's a lot of narcotics money in Tajikstan, which shares a 1,300km border with Afghanistan, a country which produces 90% of the world's opiates. One kilogram of heroin in Dushanbe is worth about $5,000 but on the streets of Europe's cities is worth hundreds of thousands. It's not hard to see why Dushanbe has an extremely high proportion of Mercedes-Benz compared to any other city in the world. The driver, who I couldn't see, ignored me and drove straight past. I looked around to check its number plate; often blacked out cars will have fancy registrations, or 'UN' at the start if it's a diplomatic car. To my surprise, before I could focus on the characters on the back of the car, dust lifted off the road as the white vehicle skidded to a stop. Without hesitation I ran up to the passenger window. A man in his thirties leant over from the driver's seat and said "sorry, I thought you were Tajik. Can I help you?" I've found that in many poor countries the elite, or at least the nouveau riche, talk horribly of their own people as if they themselves didn't belong to their own country. "I'd never stop for a Tajik person, they cause all sorts of problems", the Tajik man explained. My luck had been incredible. The third car to pass happened to be as empty a 4x4 as is possible; one driver, no passengers and no luggage. We collapsed the back seats and my bicycle fitted in perfectly. Two hours later and I was sat in the dark outside 'Mervin' fast food restaurant, using the free wifi to try and research flights from Dushanbe to London which is no simple feat. Until the very last minute, my journey home and back to Dushanbe was going to consist of six separate flights including two operated by airlines banned from Europe for appalling safety records. I was researching flights for so long that I got through both my laptop batteries and had missed the opportunity to meet some local people to find a place to stay. This wasn't a problem in my mind, I would happily sleep in the park if it meant I could have the freedom of not having to be polite and hang around with kind hosts. The next day was spent confirming flights over multiple Skype conversations with my father and trying to find somewhere to leave my bike for a month. As I'd never had such an unprecedented opportunity like this before, there were many new things I had to think about. I could take some rarely used equipment home that I didn't want to throw away, I could buy gifts for my family and I could try and find something that's cheap in Dushanbe that I could sell in England (other than opiates). I found somewhere for my bike, bought a load of cheese to give to my family (which I ended up eating 99% of as they didn't like it) and decided what stuff to take back with me. I would fly from Dushanbe to Istanbul and then on to London. 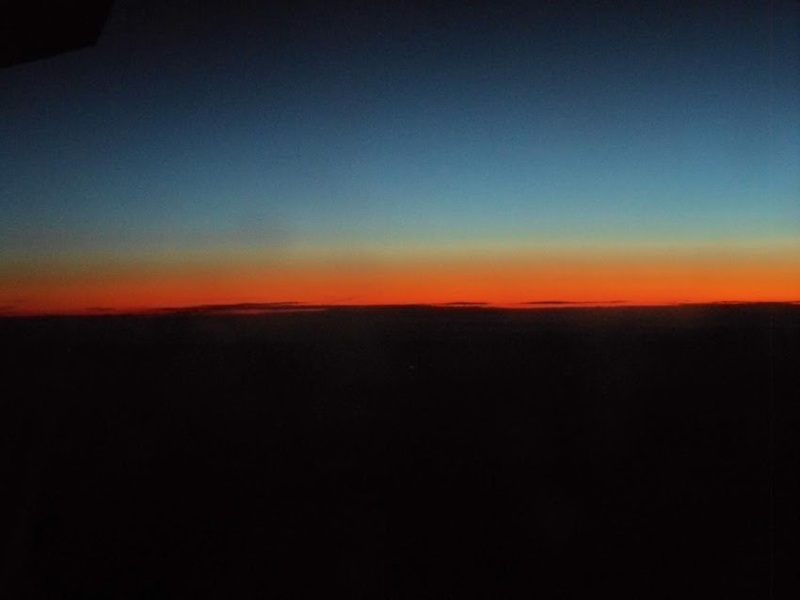 My flight was at 4am the next day. Being Tajikistan, it didn't leave the ground until 2pm. Thankfully I had booked both my flights with one airline, meaning that when I knew I would miss my connection I called them and they gave me a later flight from Istanbul. Even though I was given a later connecting fight, I still only just made it. I pushed in front of every single queue in the international transfers section of Istanbul airport and arrived at the gate without even a boarding pass; all I had was my passport. I made it with five minutes to go. Once back in England, the first thing that happened to me was that I received a fine for not having a ticket on the Heathrow Express service to Paddington. The guard on the train told me that I either had to buy for a ticket for £30 or they would send me back to Heathrow. I told them that I'm sure they're not allowed to physically force me to go back. I was in a determined mood; I only had one more connection to make and I'd be home. In the end I did get to see Nanny at the Hospice, three times in fact. Having briefly gone home, she is now back at St. Margaret's meaning the whole family, Nanny included, can enjoy the rest of her time a little bit more. 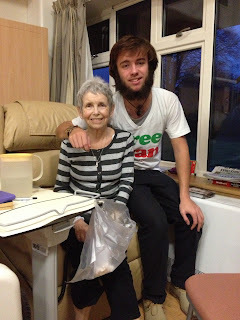 Although she's not doing too well now, it was great to be able to see her cheery smile again, talk to her about my trip and show her the newspaper articles about my fundraising efforts for the Hospice. If you would like to donate to St. Margaret's Hospice please click here. I am now back in Tajikistan and continuing my trip as before. I have been riding here for just over a week which I will write about in the next few days. I realise that I have yet to write anything about my time in Afghanistan, so that will come soon too. Hey, keep on posting, I am thrilled how Pamir will be in winter. Fantastic journey! My mum Mary Mclennan, a great friend of your grandmother in Taunton is also suffering from cancer and will probably go to St Margerets too. We will be donating to your epic effort. Best wishes from Mary , Judy, Clare and Robert.